I've just handed in two more essays for my masters, one of which took a whirlwind trip through the history of Irish international design exhibitions. I really enjoyed researching and writing this one, so thought I would share it with you. As it goes on for ages (by blog standards, not academic ones), I've split it into three parts. Here is Part #1, which introduces and explores the role design has played in the construction of Irish identity, particularly the identity of Ireland as a fledgling nation. Part #2 will look at how Irish identity was presented in key international exhibitions and displays in the 19th and 20th centuries and will be posted later this week. Finally, Part #3 will take a look at recent and current international exhibitions of Irish design to see how certain identities are being represented even now. Enjoy! The formation of a national identity is important to any country, not least one struggling with its status as a colony or coming to grips with independence. Ireland is one such country, a former British colony, gaining a degree of independence in 1922 and becoming a Republic in 1949. Ireland has attempted at various points in its history to manifest its identity in different ways: to look back at its history and find elements of its past to revive, to cultivate its indigenous language and to represent itself as different from its former oppressor, as similar to its European neighbours or as a distinct country with a distinct people and culture. This need for an identity has manifested itself to a great degree in the nation's visual and material culture. It has also manifested itself through exhibitions, and it is this manifestation of national identity through exhibitions that this seris of posts explores. Discussing key international exhibitions of Irish manufactures, craft and design from the mid 1830s to the present day, this series of posts looks at a recurring theme, that of rurality, an image of a nation that is traditional and unspoilt, that is decidedly un-urban, and whose output is craft-based and handmade. Looking at the development of these exhibitions from the 1830s onwards, and how a number of key exhibitions in this time have told and retold this story of tradition and rural life, it will focus in on the Irish Exhibition in London's Olympia in 1888, the New York World's Fair of 1939, and the Irish presentations at London Design Festival from 2012-2014, illustrating that the image of rurality endures even today. It will examine how this theme came about and how and why it has persisted in exhibitions of Irish design. Lastly, it will question whether this popular story of a rural, peripheral nation is worthy of retelling. Perhaps surprisingly for a nation not known as a global design star, design has played a key role in Ireland's modern history. It was employed – with varying degrees of success – to create the identity of an emerging independent state and to stimulate economic growth when a newly independent country had little industry and few opportunities to create employment and begin to participate in international trade. Design is integral to the production of a modern Irish identity and design exhibitions – both their contents and their display – helped to disseminate that identity abroad. In 1922, after centuries of British rule, a War of Independence and a Civil War, the Anglo-Irish Treaty was signed, giving the 26 counties of what is now the Republic of Ireland devolved power from the British government, making the Irish Free State a self-ruling dominion of the British Empire. Full independence and Republic status would be granted in 1949, but in the meantime the Free State government began to operate as independently as possible and to shape Ireland as a nation as best it could. Visual or material culture was key to the creation of this emerging nation's identity, with various attempts to differentiate the Free State from the British Empire. 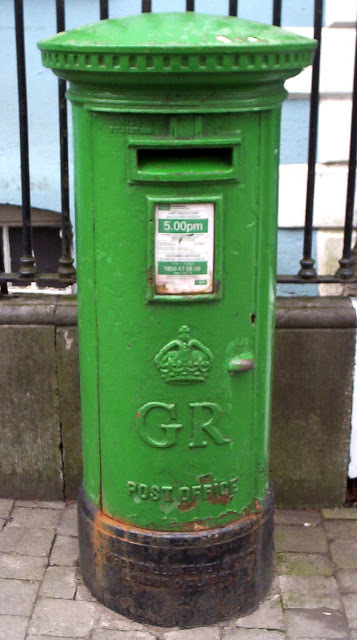 Famously, one of the first such acts was to paint the country's red Royal Mail postboxes green (above, right), and shortly after that it was decided to redesign a set of stamps to ensure all letters placed in those boxes were identifiable as Irish too. The Free State designed a new government seal and commissioned designs for new coinage (by sculptor Percy Metcalfe, pictured above, left). Few of these acts were actually necessary, as the country would continue to use postal services in place since British rule, and would still use British currency. But these acts tell us that the Free State government recognised that while many aspects of daily life in Ireland would remain the same, and indeed many of the aspects of Ireland's economic reliance on Britain and its relationship with Britain and other nations would only change very slowly, the trappings of nationhood could be created straight away. Ireland could first look like an independent nation, and really become more independent later. 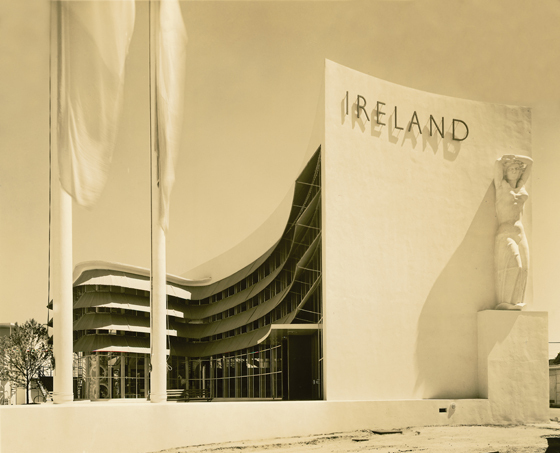 In addition to being the means to create an image of independent nationhood, design was employed in Ireland in the 20th century to help stimulate industrial growth and trade (as it had been employed in Britain and elsewhere a century before) and to support and promote what would become one of the nation's most successful industries: tourism. Where tourism has become one of Ireland's most lucrative and sustainable industries, it is the design of branding and advertising for Bord Fáilte, Ireland's tourism board and Aer Lingus, Ireland's national airline, which is some of the most accomplished and successful of the 20th century in Ireland, marrying modernist design with the rural imagery tourists wanted to see. Another notable success story of 20th century Irish design is that of the Kilkenny Design Workshops (KDW). 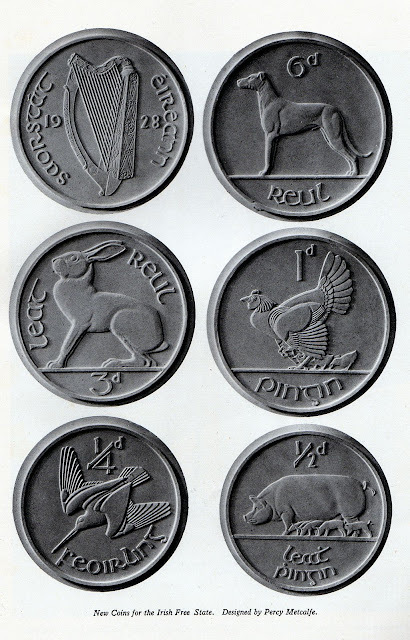 An initiative of the nation's trade and export board, Córas Tráctála Teoranta (CTT), and influenced by what is known as the Scandinavian Report, an assessment of Irish design by a group of invited Nordic design experts published in 1962, KDW was the world's first state-sponsored design agency. Founded in 1963 with the aim of incubating design practice, providing design services and fostering design in Ireland from native and international designers, an integral part of the approach of KDW (and a recommendation of the Scandinavian Report) was to use Ireland's craft skill and expertise but to marry it with modern design. This has been a key aspect to design and craft in Ireland since then, with many people working to combine contemporary design aesthetics with traditional craft processes. This meeting point between craft and design is often what is placed centre stage in exhibitions of Irish design, from the Irish participations in the international exhibitions of the 19th century to 20th century expositions and presentations at trade shows and in department stores. Recent Irish design exhibitions at London Design Festival are no different. There is another thread running through many of these exhibitions too. The image of rural Ireland has long been key to Ireland's identity, and as such has featured heavily in exhibitions of Irish design from the 19th century onwards. In her unpublished RCA thesis on Irish exhibitions and symbols, Deirdre Campion argues that Ireland's participations in international exhibitions were often framed in this rural image as a means of presenting Ireland as inferior to developed and industrialised Great Britain. This was no different to the representation of Britain's other colonies, who were all shown as primitive and underdeveloped in these international exhibitions. Once Ireland was independent, rurality was still leant upon as a means of differentiating from the nation's previous ruler. And while others may have wished to look outwards to the rest of the world and forwards to modernity (notably in Ireland's architectural community and manifested in large-scale infrastructural projects such as Ireland's hydro-electric power station at Ardnacrusha) it was clear that this image of rurality sold. It was what people outside of Ireland expected of the nation, it was what they wanted to visit and it was what they wanted to buy into. So frequently, even those that wanted to present Ireland as modern, international and progressive would be resigned to showing an element of rural life on the international stage. Stay tuned for Parts #2 and #3 of this series, coming to I Like Local soon. Great further reading on Irish design includes Ireland, Design and Visual Culture: Negotiating Modernity 1922-1992 edited by Linda King and Elaine Sisson and Kilkenny Design: 21 Years of Design in Ireland by Jeremy Addis and Nick Marchant. Deirdre Campion's thesis, Manifestations of a Nation, Ireland: Exhibitions and Symbols 1850-1950, is available to read in the the V&A's National Art Library.